WITH more places to eat per head than any other US city, it's no wonder food is high on visitors' lists in San Francisco. The city boasts more than 5000 eateries. A trip to this culinary capital is not for those on a diet. San Francisco has become a cultural melting pot since the 1849 gold rush. 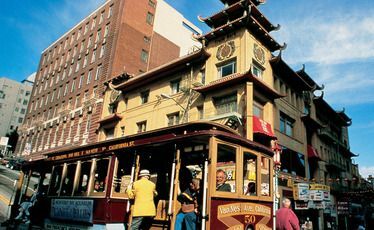 From Little Italy to Chinatown and the Latino-influenced Mission District, renowned for its burritos, the city offers every type of cuisine. There's even a piece of New Zealand in the city: raised on Waiheke Island, Anna Weinberg's Marlowe in the SoMa district is hot in the dining scene. A 15-minute walk from the centrally located Union Square, Anna and fellow Aucklander Sarah Varley dish up beautifully cooked comfort food to a buzzing crowd of affluent 30-somethings. SoMa also plays host to Alexander's Steakhouse, which combines high-end American steakhouse cuisine with a Japanese twist. The textures in every mouthful of its delicate dishes will make you swoon. North Beach is the city's bohemian heart, home to Little Italy and the Beat Poets. Most locals converse in Italian, wear Inter Milan shirts and every other man seems to be called Tony. Italian family-run businesses have been operating here since the gold rush, and you can get to know the personalities and their wares on one of the daily North Beach food tours. Come with an empty stomach as you'll be filled to breaking point with Italian baked goods. You'll visit focaccia specialist, the Liguria Bakery, which has perfected its recipe on the same site for more than 100 years. Arrive early as, once they're sold out, the family shuts shop. You'll also go behind the scenes to see one of the few bakeries still using brick ovens dating back to the 1880s, before tucking into fresh breads, cakes, fudge and a pizza. Ride a bike over the Golden Gate to burn off the calories. Three leading US coffee companies started life in San Francisco and the smell of fresh roasting wafts through the air. A large roasting machine in the window of Caffe Roma is fired up twice a week to make mellow coffee while film lovers can enjoy a long black surrounded by memorabilia at Cafe Trieste, where Francis Ford Coppola penned The Godfather. The Ferry Building is also home to a plethora of artisans. Forget the recession here, this complex is bustling with food lovers happily parting with their dollars in return for Cowgirl Creamery's local cheeses, "tasty salted pig parts" at Boccalone and all-things mushroom offered by Far West Fungi. There is also an array of restaurants including The Slanted Door, serving fresh Vietnamese food with great views of the sparkling harbour waters. Or head across the road to Ozumo, a rather refined Japanese eatery, which sashimi fans shouldn't miss. Take the chef's advice and order the hanabi - a palate-rousing combination of raw hamachi fish, avocado and a spicy ginger and jalapeno sauce. Whatever you want to eat in San Francisco, you're only a short walk or cable-car ride away.